Little Rat Makes Music is charming! 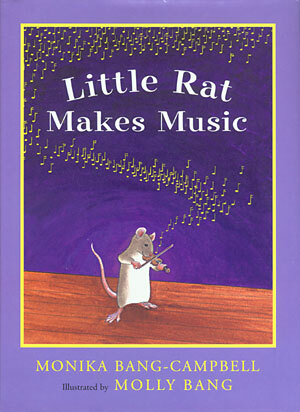 Little Rat’s family is very musical and after going to many concerts, Little Rat is captivated by the singing and plucking notes of the violin. After more exposure to the sweet strains of the violin, Little Rat starts violin lessons. Immediately, she finds those sweet sounds do not come easily and becomes very impatient (as do we all when we want something NOW!). Little rat struggles with practicing and finds other things she just must do first. Her wise music teacher, Mrs. Wingbutton, has a special way of revitalizing Little Rat’s enthusiasm. Now, practice is fun and Little Rat has a lofty goal. Kitty has a way to help Little Rat reach her goal without getting frustrated. With Kitty’s help, the goal is reached and the family has a celebration. Little Rat goes off to bed making sweet music just for her. What a delightful little book to read. The storyline is simple, yet teaches a life lesson to those reading—children and adults alike. I especially enjoyed the illustrations. If your child is not yet reading, once through the book with you, your child will be telling and retelling the story just from the pictures. They are captivating and comical and evoke the reader to feel the same emotions being felt by each charming character. This dynamic duo does it again! Find it, buy it, and enjoy it over and over again! Other books are Little Rat Sets Sail and Little Rat Rides. Get them all!